The technology for making traditional stained glass dates back at least 5,000 years and still has a place in modern and more traditional architecture. However, kiln-formed fused glass can offer a modern alternative with some great advantages such as its thermal insulating properties and the ability to ‘fuse’ colours together creating an almost limitless palette of textures, and without the often clumsy intrusion of lead to join the individual pieces. 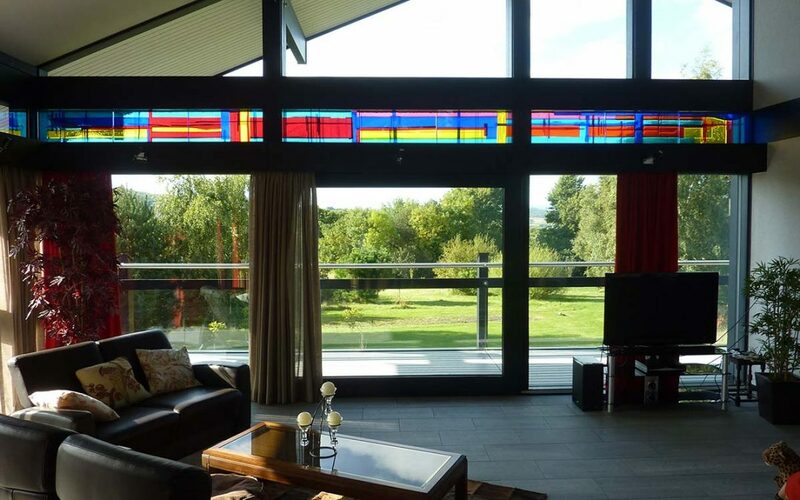 Here, we had an opportunity to create some modern stained-glass effect panels, which sat in front of the existing glazing for our client’s Huf Haus in Wales. The result, a truly vibrant band of naturally illuminated colour which changes with the light throughout the day.